In the late 1800's a significant number of immigrants from the Village of San Fele, province of Potenza, in the Basilicata region of Italy settled in the Buffalo area of Western New York, USA. 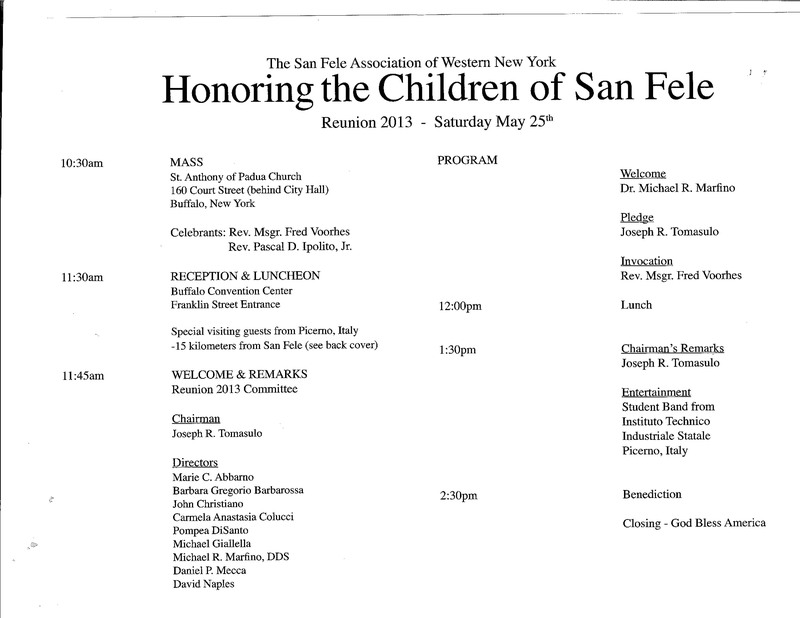 The first group from San Fele, Italy arrived in America in the early 1870's. New York City, Trenton and Newark, New Jersey and Buffalo, New York appear to have been the most popular cities. The Lapetina, Lombardo, Christiano, Naples, Andriaccio, Marino, Crecca [Crage], Lunghino, Radice, Tauriello, Tronolone and DiGiacomo families were among the first settlers in Buffalo, New York. On May 6th of the year 2000, over 600 people attended a Mass Holy Angels Church. 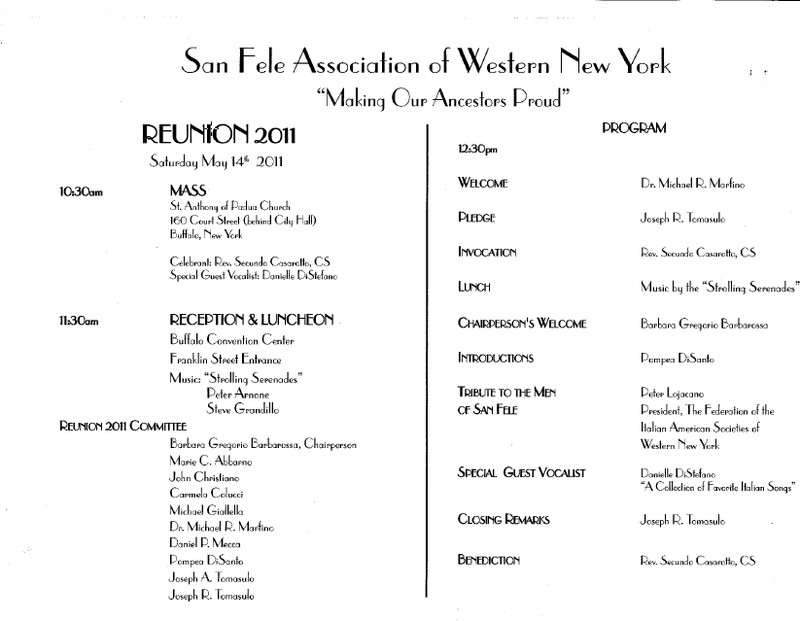 Immediately following the Mass, 300 people attended a reception at D'Youville College honoring the ancestors of the San Fele community of Buffalo, New York. The response to this affair was surprising and remarkable. The attendees witnessed a day of unforgettable happiness and joy, a return to their heritage with their ethnic family! This expression of pride and love made Reunion 2001 inevitable. Therefore, we again honored our ancestors who came to the New World and nurtured sons and daughters who struggled to make a better life for past, present, and future generations. We also paid respect to their Italian home of San Fele. This tribute was realized as we, their descendants, prayed, dined, and drank while celebrating as family and giving thanks to all those San Felesi who preceded us. 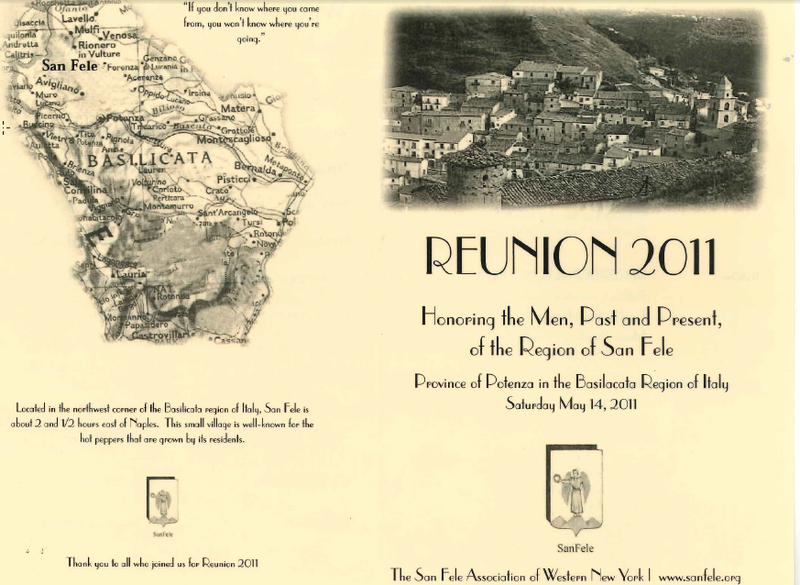 The San Fele community owes a debt of gratitude to the founding members of the San Fele Association of Western New York. These proud American Sanfelesi founders are: Carmela 'Anastasia' Colucci, Ronald 'Rubino' Carnevale, John 'Lapetina' Christiano, Michael 'Abbarno' Marfino,DDS, Hon. Mayor Anthony Masiello, Nicholas Mecca, Joseph Naples, Anthony 'Papa' Paul, Daniel and Joseph Tauriello, and Joseph F. 'Romanello' Tomasulo.